“I have a race you might be interested in”. That is how the adventure began – with that subtle inquiry from a friend. She continued “I am putting together a team of 12 people to run across Cape Cod as part of the Ragnar Relay. The race goes for two days, you probably won’t get any sleep because you will run at night, you’ll be in a van with 5 other people when you aren’t running, and if you are lucky you’ll get 1 hot shower along the way. Are you in?” Who could resist? When our team of 12 was complete we had four graduates from the Masuk High School class of 1985: Karen (Muizulis) Coffey, Marcia (Williams) Hayden, Christina (Klimkowski) Hansen, and Pete Swanson. Our fellow teammates included Sherrin Vail, Zach Brown, Mike Armstrong, Sarah Zimmerman, James Mahoney, David Valli, Maria LaRose and Christine Watson. The spirit of the race being teamwork, camaraderie and support, along with the representation from Monroe made it a natural fit for us to sign up as a Race4Chase team. All 12 teammates received a Remember Chase pin to wear during training as well as during the race. We were then honored to be asked to carry a Race4Chase baton during our run across Cape Cod. Starting in Hull, MA, the non-stop relay race took us through scenic, historic towns, along busy streets, narrow trails and the beautiful Cape Cod coastline, all with plenty of hills along the way. Our team was split into two vans of 6 people. Once van 1 completed their first series of runs, van 2 picked up the baton and ran our legs. This repeated three times with each person running a total of 3 separate legs at all hours of the day and night. When we weren’t running ourselves, we were catching up with our teammates to cheer them on and offering plenty of encouragement to other runners. Our team and the Race4Chase baton traveled 192 miles in 30 hours, 4 minutes, and 27 seconds to finish the run in Provincetown, MA. Upon completing the race we found a team who truly represents the spirit of the CMAK Foundation and Race4Chase and ceremoniously passed the baton to them. They are avid runners who also swim and bike. Sarah Dombrowski, the first to accept the baton, is a graduate from Eastern CT State University where she was a four year member and senior captain of the swim team. Sarah has been running since 2011 and is looking forward to running her first half marathon in June. She will proudly carry the Race4Chase baton during her next race. The baton will be shared amongst all 11 of her other Ragnar teammates where it may even be part of a triathalon. Once each team member has carried the baton they plan on bringing it to Santa Clarita, CA, where Sarah’s friend who introduced her to running will take the baton and it will continue its journey. 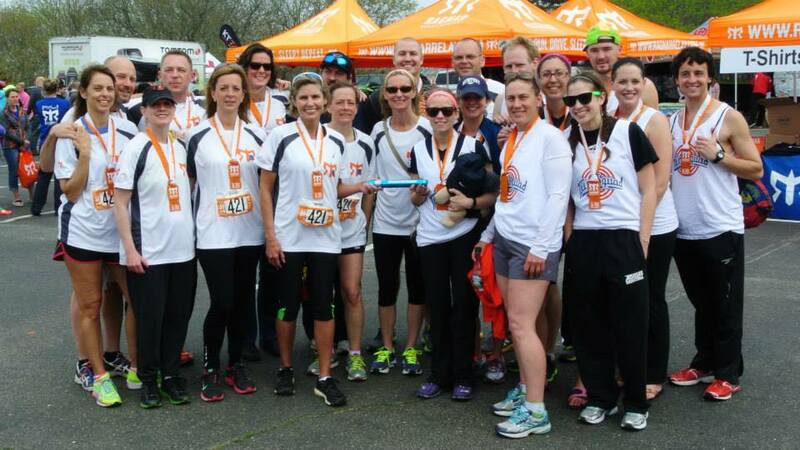 Thanks to supportive friends and family, our Ragnar Relay Race4Chase team raised $ 3,170 for the CMAK Foundation and once again we were honored to run with the Race4Chase baton in memory of Chase and to carry on the spirit, love and energy that it represents. See www.race4chase.com for more photos from the weekend.